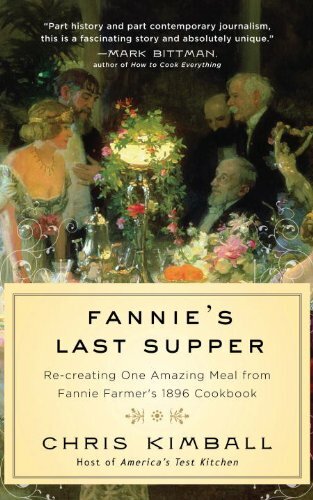 NPR has a great article up about Fannie's Last Supper, the newest book from Chris Kimball, host of PBS's America's Test Kitchen and founder of Cook's Magazine. Kimball apparently spent two years working with his staff on re-creating one epic meal: an insanely elaborate 12-course dinner based on recipes from Fannie Farmer's 1896 book The Boston Cooking School Cook-Book. In addition to the Victorian menu, Kimball's team limited themselves to Victorian cooking technology—all 12 courses were prepared on a 67-inch stove from the 1880s. I'm a vegetarian, so it's highly unlikely I'll ever be re-creating the (undoubtedly delightful) recipe for "Lemon Jelly Made With Calf's Foot Gelatin"... but if you have any calves' feet lurking in your refrigerator, now's your chance to knock the socks off of any judgmental in-laws!